We like the Nvdiia GeForce GTS 430, it's Nvdiia's first budget DirectX 11 graphics card and yet the little fella comes packing 585 million transistors and 96 stream processors. It's capable of running up-to-date DirectX 11 games at playable speeds, if you stick to modest resolutions. 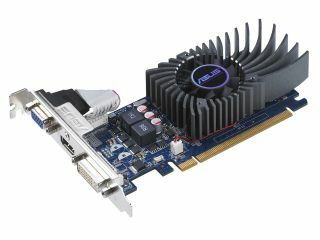 So it's not going to find its way into your next high-end gaming rig, but starting at under £60 from Dabsand available in half-height and passively cooled models, this wallet-friendly card would certainly make an ideal choice for media centre PCs, quiet PCs and budget systems that still need a usable level of 3D performance. As for HD, don't worry, it's more than capable of handling 1080p HD video playback. You'll also find most of the cards offer HDMI, so you can plug your PC into your big-screen HD ready TV. If you have your sights on something far more powerful, then a bundle you shouldn't miss is the Gigabyte AMD Ultimate Bundle. This stunning deal pairs the AMD Phenom II X6 1055T six-core processor with the lovely Gigabyte GA-890FXA-UD5 AM3 motherboard, which is simply oozing with delicious features. Of course, that on its own wouldn't be enough. For the creamy filling to this cake there are also two sticks of essential 2GB Corsair DDR3 1333MHz memory included in the bundle. They'll give you a total of 4GB of system memory. The icing comes in the form of a 64-bit copy of Microsoft Windows 7 Home Premium and two downloadable games: Storm Rise and Lost Planet. All for just under £450. Taking a break from system building and switching to a little networking talk, we recently came across a box of tricks called the Synology USB Station 2. This highly adaptable box provides five-in-one networking services including: NAS drive, Media Server, PC-less download management, music player and a USB Print Server. Running the Synology DiskStation Manager 3.0 OS it has an Ethernet connection with two USB ports. Set it up via a simple and universally-compatible web interface then share files and printer services from devices attached via the USB ports. It's clever enough that it can download BitTorrent and eMule files without the need for a PC. As a media streamer it'll handle any DLNA devices, such as the Xbox 360 or PlayStation 3. An iPhone and Android app will even stream music from the box over the internet, so you can dump your premium Spotify account. All of this only draws five watts of power, so you can safely leave it running without adding much to your electricity bill.